Over the course of mere months, former Florida Southern baseball player Jhalan Jackson escalated from the Moc’s right fielder to a minor league All-Star. On Aug. 10, Jackson received the nod to participate in the New York- Penn League Class A Short Season All-Star game at Ripken Stadium in Aberdeen, Maryland. The Winter Haven, Florida native played one season for the Mocs. There, he excelled both offensively and defensively. Jackson led the team in multiple RBI games (19) while posting a .400 batting average and a .922 slugging percentage in the 24 Sunshine State Conference games he started in. Jackson was drafted by the New York Yankees this past June in the seventh round of the MLB draft. He entered the short season playing for the organization’s class A affiliate the Staten Island Yankees. Jackson started his professional career off with a memorable home run in his first plate appearance on June 19 in a 3-2 loss against New York Mets affiliate the Brooklyn Cyclones. He went on to homer upon his first plate appearance in the sequential game in the series on June 20. In his first season as a Yankee, Jackson has compiled a .255 batting average, a .455 slugging percentage, and a .335 on base percentage in his 140 plate appearances spread across 40 games. Jackson has contributed 37 hits, 30 runs, and 30 RBIs to help lead the Yankees to a first place standing in the New York-Penn League’s McNamara division with a record of 33-30. While Jackson did not see any play time in the All-Star game on Aug. 20, he was one of just four Yankees and 56 minor leaguers to make the All-Star rosters. Jackson’s conglomerate team, the South All-Stars, went on to lose against their North All-Star counterparts in a 4-2 dual. With playoffs slotted to begin on Sept. 8, the Yankees look to cling on to their single game lead over the trailing Tampa Bay Rays affiliate Hudson Valley Renegades and their 1.5 game lead over the Baltimore Orioles affiliate Aberdeen IronBirds. 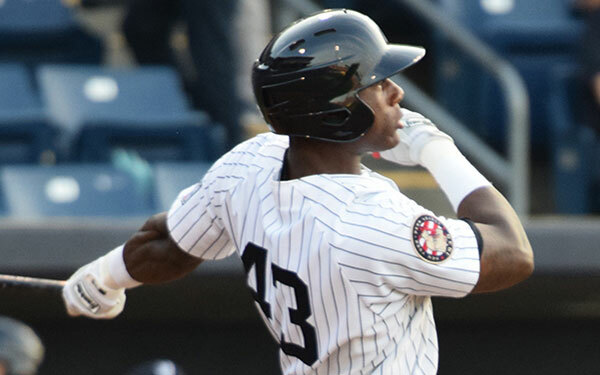 As a member of the Yankees’ farm system, Jackson can set his long-term sights on working his way up the ranks of the organization’s minor league affiliates and receiving an invitation to Spring Training at George M. Steinbrenner Field in Tampa. Until then, his games with the Yankees can be found on MiLB TV.